This gently curved crystal cluster puts a collection at [in] your fingertips. Its' 2 1/2x 1x 2 1/2" group holds a range from milk to iron-included to clear crystals from a partial elestial milk base in regrowth. An 8-edged channel faced crystal has a white phantom [rare]. 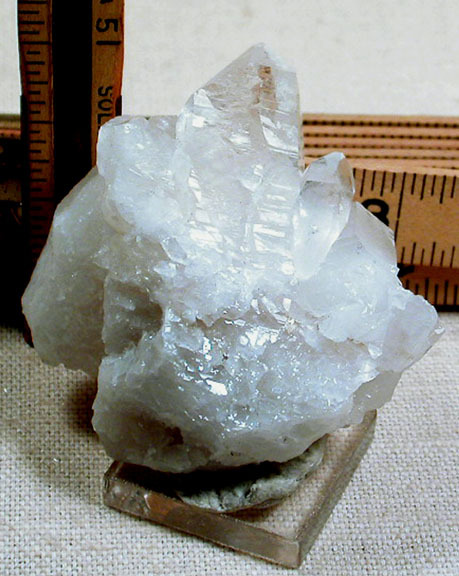 A milky crystal with veils has rainbow glitter. There's a tabular crystal with a vertical, twin penetrator. Record keepers, doubly-terminated crystals, rainbows, too.